It was only a few weeks after 9/11. We were still reeling, aching inside. I was scheduled to screen a classic of Italian neorealism in my world cinema class. 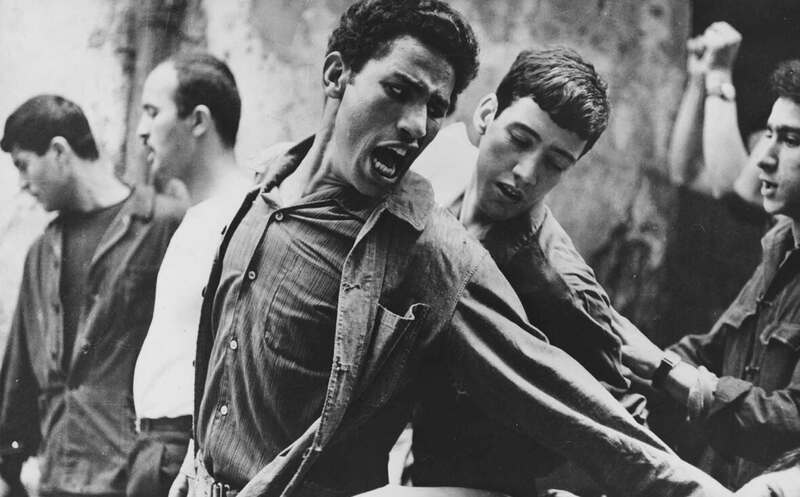 At the last minute, I decided the occasion called for a very different classic instead, The Battle of Algiers, a 1966 Italian film that recreates the uprising of the Algerian people against French colonial rule during the 1950s. With a newsreel-style grittiness and authenticity reminiscent of the neorealist masterpieces of two decades earlier, it depicts brutal acts of violence perpetrated by both sides in the conflict. Figure 1. Anti-colonial rage and lamentation in a still from The Battle of Algiers, directed by Gillo Pontecorvo (Casbah Film, 1966). During a particularly disturbing scene, in which Muslim women dressed as Westerners plant bombs in crowded cafes and milk bars in the French quarter of Algiers, one of my students jumped to his feet and stormed out of the auditorium. The rest of us finished watching the movie, which includes an equally upsetting scene of military interrogators torturing Muslim men. I called him to make peace, and we talked things out. He said he comes from a military family, where patriotism is the highest form of virtue. In his opinion, the showing of that film was unpatriotic. I asked him to come to class the next day and explain his point of view. He did, and the result was a heated and probing two-and-a-half hour debate about the responsibilities of the artist in times of national crisis. I will never forget that discussion, or that student. It embodied the fair-minded, clamorous but not-hostile exchange of views that he and I, however different our political allegiances or sense of how to combat terrorism, could both feel patriotic about. Two years after the classroom incident, when the student had graduated and moved on, he mailed me a newspaper clipping. “Professor,” the accompanying note read, “I bet you’ll like this!” And I did. It was a report that the Pentagon had screened The Battle of Algiers for high-ranking officers and military strategists who were being deployed to Iraq to help them understand not only the guerrilla tactics of the insurgents, but also their festering grievances, bred from centuries-old exploitation by the West and their own governments. In talking about art of the past with our students, perhaps the most patriotic thing we can do is allow them to work through their respective and often deeply held convictions about their nation, whether they are proud of it or ashamed, in a way that encourages dialogue rather than stifles “incorrect” viewpoints. In that non-proscriptive environment, they can explore the ideas and pent-up rage of their ideological opponents and discover for themselves what kernels of longing and logic are embedded in political positions they have been taught to abhor. True patriotism demands nothing less. Cite this article: David Lubin, “Bully Pulpit: Classroom Patriotism,” Panorama: Journal of the Association of Historians of American Art 3, no. 2 (Fall 2017), https://doi.org/10.24926/24716839.1611.